Add "Gilad's Total Body Sculpt Plus" to this order for 25% OFF! [Add $37.46]This is a special offer for this purchase. Regular price for "Gilad's Total Body Sculpt Plus" is $49.95. You qualify for a discounted price of only $37.46! Just click the check box to add this DVD set to your order. Add "Ultimate Body Sculpt" to this order for 25% OFF! [Add $37.46]This is a special offer for this purchase. 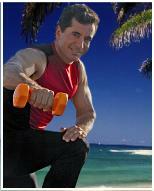 Regular price for "Gilad's Ultimate Body Sculpt" is $49.95. You qualify for a discounted price of only $37.46! Just click the check box to add this DVD set to your order. There are 15 different workouts, all under 10 minutes each! In here you will find Cardio workouts, Strength/Calorie Burn workouts, Core workouts and Sculpting workouts that target different muscle areas allowing you to focus on the body parts you wish to work on the most. Though it is resistance training that will sculpt your body, it is very important to add the Aerobics/Cardio element into the program to help maximize fat burn, strengthen the heart and improve lung capacity. When combined together these Express Workouts are made to help you get the best possible results in the least amount of time! In no time you will be able to climb a flight of stairs without getting winded and chase down your kids with out having to take a break on the park bench! The suggested 10 week schedule is balanced between Strength/Sculpting exercises, Aerobic exercises and stretching. It is given here as a guide line that will show you how you can best progress from one week to the next. Download schedule. You can also customize your own workout plan by adding or subtracting specific workouts from the program to help you meet your own individual fitness goals. The program also includes a warm up and a cool down that you should incorporate into starting off and ending any of the other workouts. "The program is designed to give you the flexibility to chose between the 10 minute workouts individually, or between working out to each DVD from Beginning to end, for 2 full and thorough 60 minute workouts per DVD!" Aloha Gilad. This DVD won a Telly Award in 2010. Average Customer Review: 5 of 5 Total Reviews: 96 Write a review. What great DVDs for the busy person. I wake up at 4 AM to start my day. These are the perfect 10 minute workouts to jump start my day! I do 2-3 of these 10 minute workouts and am ready for the day. Thanks Gilad for creating these express workouts! I love these workouts! I can mix and match and create my own longer workouts with these express workouts which target specific areas. Sometimes I don't have a lot of time, but I know I can get a good workout even doing just one of these 15 workouts. It definitely works for me!